Try to Imagine…it’s competition day, you take your dog out of your vehicle and your dog instantaneously and willingly springs into a focused and intense heel. You proceed to the judge; make your announcement and ask your dog to track. He immediately begins tracking every step – slowly and calmly yet intensely focused. He stops at every corner, checks for the next leg and then continues to follow the track. He finds and indicates every article. On the last article, you ask your dog to heel. He springs into an intense heel and you both heel to the judge with his tail happily wagging, where you present all the articles. Most importantly, all of this happens without you holding your breath! For some time, I have been observing many tracking trainers and the results they achieve. From these careful observations and from discussions with many, I have discovered that the root of the confusion that most dogs seem to have is that they are unsure of what is expected of them or are simply “too afraid to track”. 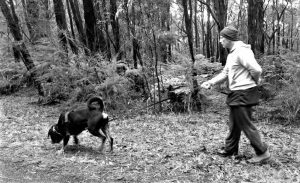 Consequently, I have long questioned the wisdom of conventional methodology and ultimately developed insights into tracking training that will give trainers and new handlers a strategy to get their dogs closer to that elusive 100-point track or simply a more precise track. The primary function of olfaction in dogs is to detect and locate odours emanating from the surrounding environment. 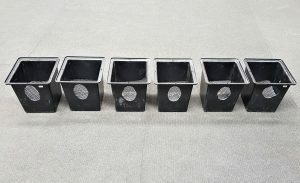 Evidence suggests that a gradient is formed from which a dog can calculate the approximate direction of the origin of the scent by differences in concentration entering the respective nostrils. 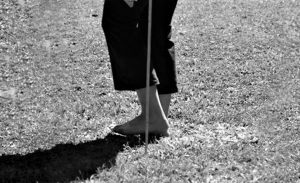 Researchers Steen and Wilson have found that directional tracking involves three distinct phases:……..
1. 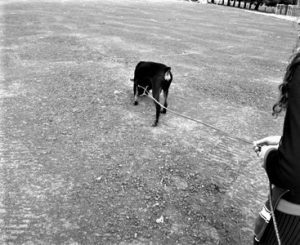 A search phase during which the dog moves and sniffs rapidly. A dog sniffs at a rate six times per second during all phases. 2. 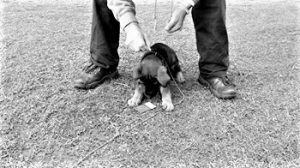 A deciding phase characterised by slower movement and longer sniffing periods with the dog’s nose placed closer to the ground. The deciding phase lasts three to five seconds and involves the dog sniffing two to five footprints before choosing a direction. 3. 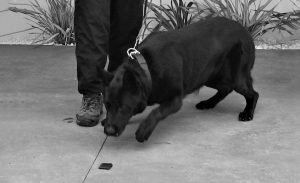 A tracking phase involves more active movement and sniffing, similar to those observed during the searching phase. The selection of a tracking dog is one of the most important aspect of successful tracking. The degree of success you achieve in tracking is not only related to the effectiveness of the training method you adopt but is very much reliant upon the quality of dog you select. A good tracking dog must posses a very strong urge to chase, play with and carry objects, with vitality and intensity. The intensity of which a dog chases the ball or tug is important however…….. Conditioned response is when you can guarantee a behaviour will be executed when the signal is presented. Anything that causes a behavioural response is called a stimulus. Some stimuli can cause responses without any learning or training. To establish a conditioned response to a stimulus, you shape the behaviour first in a controlled and quiet environment and then in effect the stimulus will cause the offering of this behaviour. That stimulus then becomes the cue, or signal, for that behaviour. You reinforce any voluntary cooperation. In this tracking system this behaviour is exactly what we are looking for as we want the indicating behaviour to be a response each and every time our dogs find the human scented article. We will not be giving the dog verbal stimulus as the human scented article is the stimulus for the indication response. This is critical to understand…..
First principle: A “tracking article” itself should have potentially no meaning to a dog. It is nothing more than a piece of material. What should have meaning to the dog is the odour of human scent on that piece of material. Tracking is nose work. That means scent is what the dog is processing. With the endless variety of materials a dog could possibly come across, it would be impossible to effectively teach them the smell of all these materials. The human contact odour is one constant that will always be there and should, therefore, be the focus of our teaching. Second principle: The scent of human odour on an article is an olfactory command to lie down. The scent of human odour on an article the dog finds on a track is an “article indication command” for the dog. In this context, it takes the place of the verbal command. Think of the use of hand signals as an example. We can make a dog perform an obedience command by making him obey the verbal command and showing him a hand signal until the hand signal replaces the audible voice command. So if the sense of hearing a command can be replaced by another sense, the sense of sight, why can’t it also be replaced by the sense of smell? Prepare the ten different articles to use in your training that have your human scent. Choose an article that will hold, or thoroughly permeate, human scent rather than leather for now. We want the dog to make the association that it is the article with human scent that he will be indicating and not the leather odour. This training is best done in a confined and quite environment with no distractions. I use my dogs compound he is housed in. The added advantage for using his compound is that there is no grass present. We don’t want any other scent associations other than the articles in question at this stage…..
A dog’s reliability to scent discriminate ensures track reliability allowing the dog to follow the human scent component instead of just ground disturbance odours. Teaching human scent discrimination first, helps eliminate many of the problems that occur out of tracking training. Without scent discrimination a dog will use whatever odours he chooses to follow the track and we will never be sure if it is human scent, ground disturbance odour or anything else the dog associates with tracking. 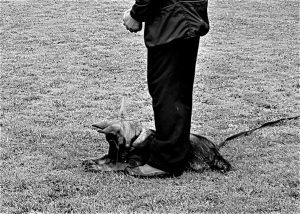 If the dog is trained strictly to work on the odours left by footprints, – (track scent) – you may not find the right person (as an example). Therefore, the aim should be to train the dog to also go on both sides of where you know the footprints to be and pick up the rafts that have settled to the ground downwind from the footprints. When it comes to line handling, the following advice is very important. In the context of tracking and line handling, there can be no ambiguity. Your lead handling finesse is crucial and it is important that it is always identical where possible during the “SLOW” teaching phase and during tracking. Be careful to not get frustrated and harshly correct your dog during this phase. This will hamper your dog’s understanding of the “SLOW” command and may make him panic or get confused and associate the walk with stress. I believe that a tracking dog should always be tracking on a taught line but once again at a slow pace. The level of tension should be such that you know the dog is moving in a deliberate forward motion. Any slackness in the tracking line should in theory suggest the dog is stationary for what ever reason and that you should also remain stationary until the dog regains composure and begins moving forward. The dog must realise that he can only move forward when he puts his head down as close as possible to scent source, commences tracking and shows deliberate tracking behaviour. At this point, we need to deviate a little to address an area unique to tracking which must be conquered before starting tracking and in particular track laying. Track laying is the subject of more bad tracking training than any other training. Unless the track is well planned and laid for success, training cannot progress smoothly. Furthermore, if the handler does not always know the exact location of the track, guidance cannot be applied and the dog will learn undesirable habits. For instance, if the handler is uncertain about the exact location of a corner, and the dog loses the corner – how can guidance be applied? Knowing how to lay and then finding the track requires the same level of concentration from the track layer that is required from the dog. A novice track layer will look at a field and see only a field. The experienced track-layer will look at the same field and see a multitude of natural track markers such as plants, undulations, tall trees, rocks and mixed cover. As you to lengthen the tracks, you will inevitably encounter changes in conditions i.e. Drier grass, longer grass, shorter grass, more clover, less clover, sparser vegetation, different plant composition, etc. All these changes will help a dog adapt to changes when tracking. When changes to conditions are very obvious, we should use this as a teaching opportunity. My approach is to not place the article on any significantly changed surface condition otherwise you run the risk of this becoming a concomitant cue. I generally place the article at a short distance after the significantly changed surface condition. Once the dog becomes proficient at surface condition changes you may then place an article on the significantly changed surface condition. This teaches the dog that surface changes are part of tracking and articles can be found anywhere. In the final stages, in order to truly get a profound tracking dog, you will need to “proof”. This means to conduct exercises so that the dog is offered an opportunity to make mistakes, thereby testing sureness with an opportunity for guidance if a mistake does occur. It is also a test of previous training. During the first part of our sequencing, we put a pressure collar on our dog and then allow him to go to the vehicle. 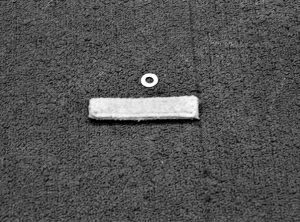 In this next phase we will add an additional collar, the “Remote Trainer”. Before we discuss the “Remote Trainer” I feel the need to talk about the perception and my personal stand on this tool. Since 1981 the passion in my life has been dominated by the constant improvement and development of my breeds of interest; those breeds being the Dobermann and German Shepherd Dog. 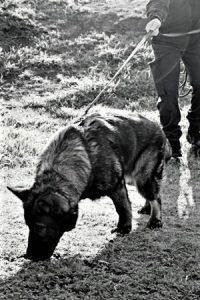 As a fervent believer in the Dobermann and German Shepherd Dog being working dogs, I accept without question that these dogs require constant testing, training and development in order to see the breed’s progress, and also individuals within the breed, move forward in the way most advantageous to all dog owners, trainers and breeders. It has been suggested to me by many that this controversial topic of the “Remote Trainer” will severely hamper the “palatability” of this book, however this book has not been written to be a best seller but a means of educating our community into the possibility of what knowledge and education can do. In essence it is the lack of knowledge and understanding that has created the controversy that currently exists. I know in my heart that you – the readers and dog owners are entirely reasonable and scientifically minded thinkers. Based on these assumptions my intention is in encouraging you to think critically about the support and stance that you personally and officially take on “Remote Trainers.” This stance currently affects all mindful Dog Owners, Breeders, Trainers, World championship competitors, Police departments and Law Enforcement agencies globally. access to the most appropriate tools to train in the most efficient and humane fashion possible. As people who train and own dogs, there is a vast amount we need to know and understand. Furthermore, this core of knowledge is imperative for the well-being and benefit of our dogs and for ourselves, and it is important to possess a keen understanding of these concepts before we start training any dog. All this information is vital to the human-canine relationship, and therefore the bond of trust that we desire to create with our dogs. (A love of working with dogs is not enough, it needs to be coupled with a thirst for knowledge). These ‘Know How’s’ not only strengthen the bond we share with our canine friends, but also provides us the platform from which to teach them and help them learn what we consider successful and unsuccessful behaviour. Just like children, dogs need to be able to learn these behaviours, through experience, reinforcement and repetition. It is widely believed by experienced trainers and canine behaviourists that positive reward based training creates around 50% of the learnt behavioural picture. If we accept this statement as fact, then we also must accept that only using positive reward based training methodologies leaves us without the ability to motivate the other 50% of the behavioural picture. Let’s look at it from the human perspective, and consider the following questions that are created as a result of critical examination of this fact. Why do we get fined or jailed when we break the law? When was the last time you received a letter from the Police or Government thanking you for being a well behaved citizen? The answer to the last question is never (or exceedingly unlikely); it is simply expected and one is required to use judicious discretion and apply shrewd judgement. Generally our properly taught values and our life experiences are expected to empower us to make the correct decisions. Having said this, it has been proven that dogs don’t have the same capabilities of reason and rational thought, and hence the community is simply expected to control their dogs or perhaps their dogs are expected to know what is acceptable or unacceptable behaviour. How is this possible when people don’t know how to truly train or manage an animal you may well ask? Think back to your first few dogs you owned and now look forward. 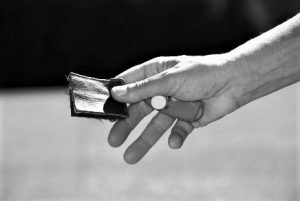 It is only the fact that you have been working with dogs diligently and consistently for such many years that you are now capable of handing your dogs appropriately. That has taken many years of work. In the 21st century you don’t need to reinvent the wheel. It has all been done and all dog people should be able to benefit from this science based information. I firmly believe that education of the dog owning public is the clear solution, and the freedom to be able to express our opinions and position of training techniques that are an enormous benefit to the dog community. Educating the dog owning public is unassailable critical. Responsibility for this education must start with the person who allows an animal to leave his or her care. Our breeders, community, vets, vet nurses, and politicians too need to begin to understand the most basic principles of canine behaviour when making practical, meaningful, responsible policies at any level. Sadly, the reality is that the vast majority of dog owners don’t have much access to lead them to the understanding of canine training or behaviour, yet these people own the votes that pass legislation (reasonable and unreasonable) based on the incumbent principle of penalising the owners for transgression. Even though most voters also have next to no understanding of the mitigating circumstances that exist regarding the practicality of the laws they vote for or against. This is the current state of affairs, a state of affairs that I believe to be a no win situation for all dog owners in both the long and short term. The implication of having learnt something is that a change of behaviour is the direct result of something connected to a past experience. 1. To acquire knowledge or skill through study, instruction, or experience: to learn French; to learn to ski. 3. To gain (a habit, mannerism, etc) by experience, exposure to example, or the like; acquire eg: She learned patience from her father. If we take the above description literally then we all know that ‘Learning’ is stressful. Motivation is recognised as a key factor which influences a given behaviour will be performed, and the frequency of intensity of its performance. Therefore, motivation plays an integral part in the ‘Know How’ of training our dogs. We must be well versed in the science of motivation as well as the science of learning. Motivation is like fuel in your vehicle – without it the engine that drives all learning will not run. Motivation is used to describe the forces which operate within an animal to attain the desired result (target behaviour). The main point of understanding in all of this is that of the relationship between learning and motivation. These two principles are so deeply entwined and interdependent that it is fruitless to attempt to conceive one concept existing without the other. For the most part, learning does not occur without motivation. Even though a behaviour is learned, however, it may not be performed if the animal is not motivated to respond. In any training situation, it is important that we all consider the motivational state of the animal we are training, as well as all competing motivators, for example, having a rabbit running across your dog’s path during a recall exercise. This is simply to illustrate that motivation is critical in animal learning and where appropriate training aids are important in obtaining the desired response. “Markers, such as clickers, are as essential a tool as Remote Trainers”. My stand, along with a magnitude of canine behaviourists in the world, is that these instruments are excellent tools used correctly. Currently in my state we are expected to have permission to use the Remote Collars from a vet in writing, however I humbly ask the question; please point out the expert vet that understands how to use the remote trainer and demonstrate its application as a tool for quality learning and not as a punishment device as the instrument is perceived. I personally am of the opinion and recommend that all people buying these instruments undergo formal training not only to learn how to use them correctly but to also understand animal learning, appropriate animal management and responsible dog ownership. I am making a considered and deeply honest effort in this book to ask you to critically consider these most pressing and concerning issues, as they confront us in our capacity as truly committed long term dog lovers and trainers. I have a sincere and enduring passion for all breeds, especially the German Shepherd and Dobermann, the breeds to which I have dedicated almost 30 years of my life to improving and developing. Moreover I believe that we, the dog owning public, must not ‘sit on our hands’ and allow ill-conceived and erroneous laws such as those directed at remote training devices and breed specific legislation go unchallenged. We the canine community must help our governments to see the reality about appropriate training devices which are an asset to the dog community in helping people manage their dogs and help decrease community risk assessment issues that may exist.